Contractors: Edward Kraemer & Sons, Inc. The new Navajo Bridge in Grand Canyon National Park is the only crossing of the Colorado River for a stretch of 965 km (600 miles). 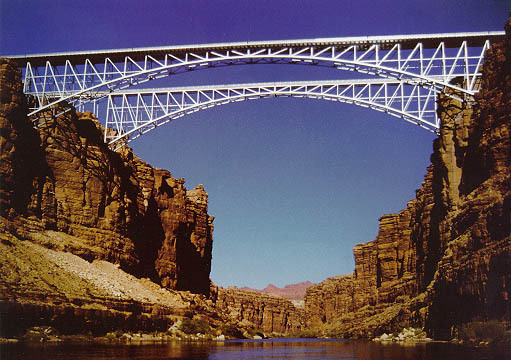 The $15 million steel arch bridge carries traffic across Marble Canyon, 143m (470 feet) above the Colorado River. The 1929 Navajo Bridge remains a pedestrian bridge. High strength steel was used in the new bridge in order to be visually compatible with the historic bridge and its setting.